This chapter examines the effect of supply chain disruptions on organizational performance. We employ a systematic literature review to identify different conceptualizations and theorizations of supply chain disruptions, and to understand how different types of supply chain disruptions affect organizational performance. We later discuss organizational capabilities (resilience enhancers) that can improve an organizational response to supply chain disruptions. 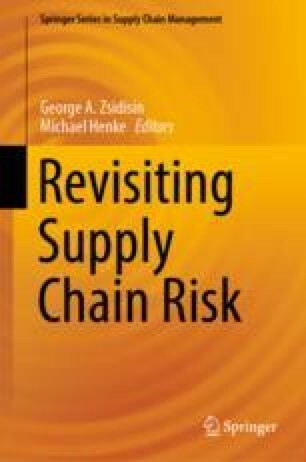 Finally, we outline future research directions in supply chain risk management and supply chain resilience. This research is based upon work supported by the National Science Foundation (NSF) under Grant number 123887 (Research Initiation Award: Understanding Risks and Disruptions in Supply Chains and their Effect on Firm and Supply Chain Performance).